G18 – Display size may be intimidating. Display size may be intimidating. The use of large displays allows a better presenting of the contents although sometimes a large display size may be intimidating. The use of a smaller display may be less intimidating. The display size may be intimidating in a doctor’s office. 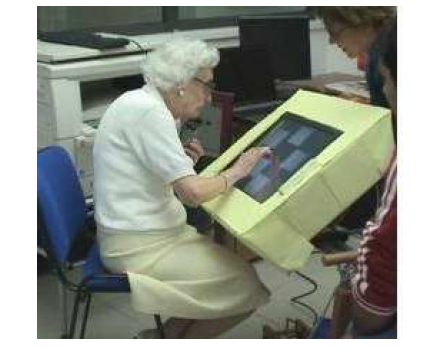 Accessibility, Comfort, Elderly, Hardware, Multi-Touch, Testing. G17 – Consider a tilted or adjustable display, can ease the interface visualization. Consider a tilted or adjustable display, can ease the interface visualization. 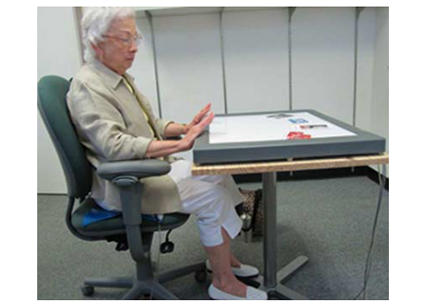 The use of a tilted or adjustable display attenuates the motor and visual impairments of the older adults. An example of use of a tilted display by an older user. 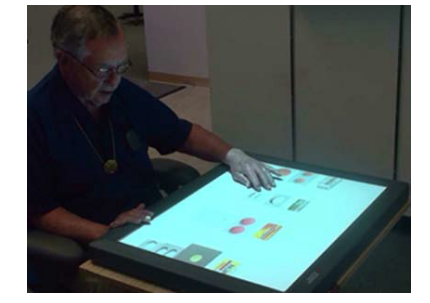 Accessibility, Comfort, Elderly, Hardware, Multi-touch, Testing, Vision. G16 – Positioning at the surface is critical, the user should be able easily reach the interface corners. Positioning at the surface is critical, the user should to achieve with easiness the interface corners. The positioning of the user should allow to achieve with easiness the interface corners. Use of a adjustable chair contributes to a comfortable position for interacting throughout the surface. An example of a correct posture of an older adult, using an adjustable chair during a task. Accessibility, Comfort, Elderly, Hardware, Motor, Multi-Touch, Testing.